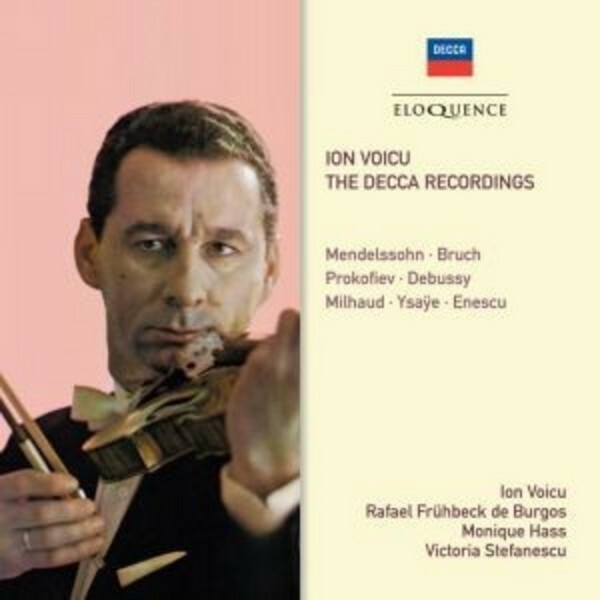 Ion Voicu’s Decca recordings ranged from the popular – the Mendelssohn and Bruch Concertos, a favourite coupling in the LP era – to the highly discriminating. This collection, bringing together his three recordings for Decca, include several twentieth-century sonatas for violin and piano with Monique Haas (Prokofiev, Milhaud, Debussy) and Voicu's compatriot Victoria Stefanescu (Ravel, Enescu). All these recordings receive their first release on CD, and Tully Potter provides the insightful liner notes. Ion Voicu was a legend in his own country, Romania, and in the profession at large, and appeared in most major musical centres. Yet he was not as well known in the English-speaking countries as he should have been. The long cold war and the dictatorial regime in his native land were mainly to blame for this state of affairs, but fortunately Voicu was able to make a few precious recordings on visits to the west. Ion Voicu was born into the gypsy tradition in Bucharest on 8 October 1923. His father was a violinist and the family could trace their musical involvement back 300 years. He made his concert début aged sixteen, with Paganini's First Concerto.